Open Sonic is a free game based on the Sonic the Hedgehog universe. The game's code is open-source, but much of the game's media is not. The game introduces a different style of gameplay called cooperative play, in which it's possible to control three characters simultaneously. 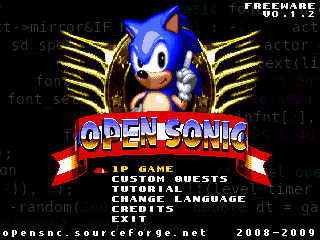 Unlike most similar games, Open Sonic provides a greater level of interaction between the player and the levels. It's more than just a jump'n'run; the user must come up with some strategy in order to get through the levels. Open Sonic is written from the ground up in C language and uses the Allegro game programming library for graphics, sounds, player input and timers. Currently this game works on Microsoft Windows and GNU/Linux. Open Sonic is requesting artists to help replace ripped artwork and music with new and original user-made resources on their home page. This is to help provide original content that can be licensed along with the game engine and distributed by Linux distributions and to avoid copyright infringement. "Open Sonic" includes a level editor with a 360-degree style engine. It includes different brick types, such as 'clouds', which allow the player to go through the bottom of a platform and land on a solid floor. It also includes a grid, which is useful for spacing out bricks evenly. The engine also allows you to make your own custom brickset by using .png images of different bricks to put into the game. Built levels (along with some custom bricksets) are shared through the forum. Surge the Rabbit: A rabbit who is able to go through special DNA doors placed along the game. He is a bit clueless at times, but he has courage whenever something important to him is in danger. Neon the Squirrel: A (rocket) flying squirrel who is able to pick up the other characters and fly with them. Neon is Surge's best friend ever since Neon saved Surge's life during a battle. Charge the Badger: A somewhat rude badger who wants revenge on Gimacian the Dark. His forest home was massacred by Gimacian, and he was found tied by vines to a tree by Surge. He can plow through some walls without spinning, glide in the air, and climb walls with his claws. Gimacian the Dark: An evil wizard (species undecided for the time being) who is focused on obtaining ultimate power, and will stop at nothing to get it. He uses dark magic to battle, which is reflected by his apathy to those weaker than him and his fear of those who are more powerful. He prefers not to get his hands dirty, letting monsters of darkness do his work for him. He wants to use the Dimensional Scepter, an artifact so powerful that it was banished to a secret dimension. He needs the Dimensional Rings to reach it, however, and his search for them leads a path of destruction behind him. Sharp the Porcupine: Even be an old and evil porcupine, anyway, not much is known about this creature , but it is found guarding the Dimensional Scepter, which only responds to the Dimensional Rings. It's quills are poisonous, so it uses them as daggers and throws them at whoever he fights. Currently, there are 11 normal stages planned, and 2 extra stages (Only available if you collect the Dimensional Rings) planned. Teamwork is planning on being introduced as the game continues. A lush, green valley with wooded areas and clearings with many mountains in the background. This level takes place on a massive dam. There is water gushing all around the player, and large water tanks introduce underwater gameplay. A speed-oreinted level in another dimension that has more running sections than other stages. This will be the most colorful stage in the game. Charge's home, taken over by creatures of darkness. There is a massive amount of enemies in this level. This introduces Charge to the game. A large urban area covered in ice due to a mechanical device Gimacian built. A large stadium in the middle of City Chill Zone, which stands out from the scenery. Gimacian fights the characters on his own for the first time here. A desert/sand level filled with dangerous dragons under the control of Gimacian. Neon is held captive here for most of the game. A large temple that is filled with water located right below Dragon Egg Zone. This will be the more difficult of the water levels. Lots of secrets about Neon and Surge are revealed, as well as the truth about the Dimensional Rings and Scepter. An underground level filled with molten metal and crystals being used to make Gimacian's Sky Fortress. Only Neon and Charge are in this level, and the acts switch between this and Spring Forge (Ordered like so: Magma Mines act 1, Spring Forge act 1, Magma Mines act 2, and so on). The factory where spring pads, spikes, and other common items in levels are made. This level is a front for the mines below, however. Only Surge goes through this level. Gimacian's ultimate weapon, filled with massive security systems and crawling with his dark minions. Gimacian fakes the characters out and winds up making dark versions of each of them, who share the same abilities as they do. This is a 3-round fight against all of them. The game ends here if you didn't collect all of the Dimensional Rings. If you did, the game continues with 2 additional zones. The dimension where the Scepter rests. It's planned to be very challenging and focues on teamwork. The mysterious character behind it all reveals himself, and the characters go super to have an epic duel that spans universes! Everything here is subject to change. Levels may be added or removed when the final release is finished.